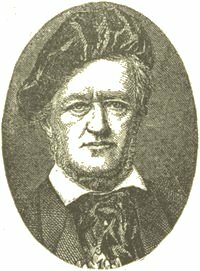 Richard Wagner's personality has been so overshadowed by and almost merged in the great controversy which his schemes of reform in opera raised, that his life and character are often now sorely misjudged--just as his music long was--by those who have not the time, the inclination, or the ability to understand the facts and the issues. Before briefly stating then the theories he propounded and their development, as shown in successive music dramas, it will be well to summarize the story of a life (1813-83) during which he was called to endure so much vicissitude, trial and temptation, suffering and defeat. Born in Leipsic, on May 22, 1813, the youngest of nine children, Wilhelm Richard was only five months old when his father died. His mother's second marriage entailed a removal to Dresden, where, at the Kreuzschule, young Wagner received an excellent liberal education. At the age of thirteen the bent of his taste, as well as his diligence, was shown by his translation (out of school hours) of the first twelve books of the "Odyssey." In the following year his passion for poetry found expression in a grand tragedy. "It was a mixture," he says, "of Hamlet and Lear. Forty-two persons died in the course of the play, and, for want of more characters, I had to make some of them reappear as ghosts in the last act." Weber, who was then conductor of the Dresden opera, seems to have attracted the boy both by his personality and by his music; but it was Beethoven's music which gave him his real inspiration. From 1830 to 1833 many compositions after standard models are evidence of hard and systematic work and in 1833 he began his long career as an operatic composer with "Die Feen" which, however, never reached the dignity of performance till 1888--five years after Wagner's death. After some time spent in very unremunerative routine work in Heidelberg, Koenigsberg, and Riga (where in 1836 he married), he resolved, in 1839, to try his fortune in Paris with "Rienzi," a new opera, written on the lines of the Paris Grand Opera and with all its great resources in view. 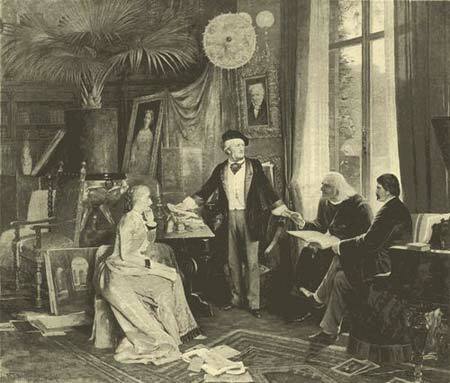 From the month's terrific storm in the North Sea, through which the vessel struggled to its haven, till the spring of 1842, when Wagner left Paris with "Rienzi" unperformed, heartsick with hope deferred, his lot was a hard and bitter one. Berlioz, in similar straits, supported himself by singing in the chorus of a second-rate theatre. Wagner was refused even that humble post. In 1842 "Rienzi" was accepted at Dresden, and its signal success led to his appointment as Capellmeister there (January, 1843). In the following year the "Flying Dutchman" was not so enthusiastically received, but it has since easily distanced the earlier work in popular favor. The story was suggested to his mind during the stormy voyage from Riga; and it is a remarkable fact that the wonderful tone-picture of Norway's storm-beaten shore was painted by one who, till that voyage, had never set eyes on the sea. In 1845 his new opera, "Tannhaeuser," proved at first a comparative failure. The subject, one which had been proposed to Weber in 1814, attracted Wagner while he was in Paris, and during his studies for the libretto he found also the first suggestions of "Lohengrin" and "Parsifal." The temporary failure of the opera led him to the consideration and self-examination which resulted in the elaborate exposition of his ideal (in "Opera and Drama," and many other essays). "I saw a single possibility before me," he writes, "to induce the public to understand and participate in my aims as an artist." "Lohengrin" was finished early in 1848, and also the poem of "Siegfried's Tod," the result of Wagner's studies in the old Nibelungen Lied; but a too warm sympathy with some of the aims of the revolutionary party (which reigned for two short days behind the street barricades in Dresden, May, 1849) rendered his absence from Saxony advisable, and a few days later news reached him in Weimar that a warrant was issued for his arrest. With a passport procured by Liszt he fled across the frontier, and for nearly twelve years the bitterness of exile was added to the hardships of poverty. It is this period which is mainly responsible for Wagner's polemical writings, so biting in their sarcasm, and often unfair in their attacks. He was a good hater; one of the most fiendish pamphlets in existence is the "Capitulation" (1871), in which Wagner, safe from poverty (thanks to the kindness of Liszt and the munificence of Ludwig II., of Bavaria), and nearing the summit of his ambition, but remembering only his misfortunes and his slights, gloated in public over the horrors which were making a hell of the fairest city on earth. There is excuse at least, if not justification, to be found for his attacks on Meyerbeer and others; there are considerations to be taken into account while one reads with humiliation and pity the correspondence between Wagner and his benefactor, Liszt; but it is sad that an affectionate, humane, intensely human, to say nothing of an artistic, nature, could so blaspheme against the first principles of humanity. In 1852 the poem of the "Nibelungen Ring Trilogy" was finished. In 1854 "Rheingold" (the introduction of "Vorabend") was ready, and "Die Walkuere" (Part I.) in 1856. But "tired," as he said, "of heaping one silent score upon another," he left "Siegfried" unfinished, and turned to the story of "Tristan." The poem was completed in 1857, and the music two years later. At last, in 1861, he received permission to return to Germany, and in Vienna he had the first opportunity of hearing his own "Lohengrin." For three years the struggle with fortune seems to have been harder than ever before, and Wagner, in broken health, had practically determined to give up the unequal contest, when an invitation was sent him by Ludwig II., the young King of Bavaria--"Come here and finish your work." Here at last was salvation for Wagner, and the rest of his life was comparatively smooth. In 1865 "Tristan und Isolde" was performed at Munich, and was followed three years later by a comic opera, "Die Meistersinger," the first sketches of which date from 1845. "Siegfried" ("Nibelungen Ring," Part II.) was completed in 1869, and in the following year Wagner married Cosima, the daughter of Liszt, and formerly the wife of Von Buelow. His first wife, from whom he had been separated in 1861, died at Dresden in 1866. A theatre built somewhere off the main lines of traffic, and specially constructed for the performance of Wagner's later works, must have seemed the most impracticable and visionary of proposals in 1870; and yet, chiefly through the unwearying exertions of Carl Tausig (and, after his death, of the various Wagner societies), the foundation-stone of the Baireuth Theatre was laid in 1872, and in 1876, two years after the completion of the "Goetterdaemmerung" ("Nibelungen Ring," Part III. ), it became an accomplished fact. The first work given was the entire "Trilogy;" and in July, 1882, Wagner's long and stormy career was magnificently crowned there by the first performance of "Parsifal." A few weeks later his health showed signs of giving way, and he resolved to spend the winter at Venice. There he died suddenly, February 13, 1883, and was buried in the garden of his own house, Wahnfried, at Baireuth. "October, 1781.--Verse indeed is indispensable for music, but rhyme is bad in its very nature.... It would be by far the best if a good composer, understanding the theatre and knowing how to produce a piece, and a clever poet, could be united in one...."
Other but comparatively unimportant features in the Wagner music drama are, e.g., the use of the Leitmotiv, or leading motive--found occasionally in Gluck, Mozart, Weber, etc., but here first adopted with a definite purpose, and the contention for mythological rather than historical subjects--now largely admitted. But all Wagner's principles would have been useless without the energy and perseverance which directed his work, the loving study which stored his memory with all the great works of his predecessors, and, above all, the genius which commands the admiration of the musical world. Wagner's works show a remarkable and progressive development. "Rienzi" is quite in the grand opera style of Meyerbeer, Spontini, etc. The "Flying Dutchman" is a deliberate departure from that style, and in romantic opera strikes out for itself a new line, which, followed still further in "Tannhaeuser," reaches its stage of perfection in "Lohengrin." From this time dates the music drama, of which "Tristan" is the most uncompromising type, and by virtue of wonderful orchestration, and the intense pathos of the beautifully written poem, the most fascinating of all. The "Trilogy" ("Walkuere," "Siegfried," "Goetterdaemmerung," with the "Rheingold" as introduction) is a very unequal work. It is full of Wagner's most inspired writing and most marvellous orchestration; but it is too long and too diffuse. The plot also is strangely confused and uninteresting, and fails alike as a story and as a vehicle of theories, morals, or religion. "Parsifal," with its sacred allegory, its lofty nobility of tone, and its pure mysticism, stands on a platform by itself, and is almost above criticism, or praise, or blame. The libretto alone might have won Wagner immortality, so original is it and perfect in intention; and the music seems to be no longer a mere accessory to the effect, but the very essence and fragrance of the great conception.